All too often, analyses of African radicalization processes are affected by unconscious stereotyping. This can be seen in word choices implying that Africa can only be infected, penetrated, or infiltrated by external radical groups. Africa seems to lack its own agency and to be the passive object in a sort of neo-colonial perspective. Naturally, having its own homegrown groups is nothing Africa should be proud of, but understanding the particularities of African groups is a crucial prerequisite for drawing up scenarios on their course of development and likely fates. Omar Hammani (aka Abu Mansour al-Amriki), the Syrian-American fighter who joined al-Shabab in 2006 but was killed by members of the same group in 2013. One of the most significant case studies is undoubtedly that of al-Shabab in Somalia, especially after its ba’ya (pledge of allegiance) to al-Qaeda in 2012. This is a group with reach – between 2007 and 2012 more than 20 individuals from the Somali community in distant Minneapolis left the United States to join al-Shabab. The first notable characteristic of radicalization processes in Somalia is the context. In the overwhelming majority of cases, they take place against a backdrop of widespread and continuous violence. Wars are fertile ground for radicalization. Entire generations knowing nothing other than conflict and instability are highly vulnerable. The second characteristic of radicalization in many areas of sub-Saharan Africa is the political framework of failed or semi-failed states. When a state is not capable or simply not willing to provide for citizens’ basic needs and protect their right to life, the enormous social gaps are easily filled by jihadis, from tangible everyday levels through to sophisticated messaging. The incubator for many of al-Shaaab’s leaders and indeed the group itself was al-Ittihad al-Islami (AIAI, the Islamic Union). It was a Salafi group that reached its peak strength in the 1990s, after the fall of Said Barre’s regime (1969-1991) and the outbreak of civil war. Its core consisted of a group of Somali extremists educated in the Middle East. It was partly funded and armed by Osama bin Laden. In the early 2000s, the group fractured badly. The old guard of al-Ittihad al-Islamy decided to form a political front while the younger generation, mostly embodied by radical fighters, pursued their utopia – the creation of an Islamic government for the whole country. Their leader from 2004 onwards was Ahmad Umar, also known as Abu Ubaidah. Umar remains the leader today. The younger members of the group eventually joined forces with the Islamic Courts Union (ICU) and gained control of Mogadishu in 2006. Inevitably, this rapid advance stoked the fears of the neighboring countries. Ethiopia in particular was deeply alarmed and the Christian-majority nation answered a call for help from the transitional Somali government by invading Somalia in December 2006. It ousted the Islamic Courts Union from the capital city. 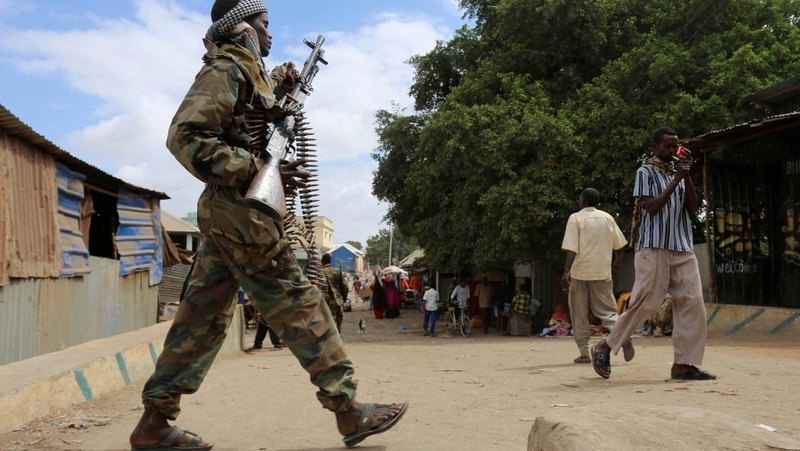 After most of the ICU fled to neighboring countries, al-Shabaab retreated to the south, where it began organizing guerrilla assaults on Ethiopian forces. During these years the group was transformed into a fully-fledged insurgency, gaining control over large areas in central and southern Somalia. As for funding, counterterrorism experts say al-Shabaab has benefited from several sources of income over the years. They include revenue from other terrorist groups, members of the Somali diaspora, charities, piracy, kidnapping, and extortion from local businesses. The governments of Eritrea, Iran, Syria, Qatar, and Yemen have also been accused of financing the group, although they deny these claims. In spite of setbacks, al-Shabab is still resilient. It is carrying on with its strategy of asymmetric warfare and retains control of local government in quite significant amounts of territory. The Islamic State in Somalia (ISS), or Abnaa ul-Calipha (Sons of the Caliph), emerged in 2015 as a splinter group of al-Shabaab. It is affiliated to Islamic State. It operates in the mountainous areas of Puntland in the north and has claimed responsibility for several terrorist attacks across Somalia. Interestingly, ISS is led by Abdulqadir Mumin, a Somali-born British citizen who returned to Somalia in 2010 to join al-Shabab. In 2014 his local leadership surrendered to the government forces. Mumin disagreed with this choice and created his own group, which became Abnaa ul-Calipha. This is one of the emblematic examples of the quick ascent of foreign fighters within the jihadi landscape and one of the first cases in which a foreign fighter creates his own group. From the outset, this group has pressed al-Shabab to distance itself from al-Qaeda. A new group affiliated to Islamic State-is the Islamic State in Somalia, Kenya, Tanzania and Uganda (ISISSKTU), also known as Jahba East Africa (Islamic State / ISIS / ISISSKTU). Like ISS, it is a splinter group of al-Shabaab but, its leadership is Kenyan. It was headed by Mohamed Abdi Ali, a Kenyan doctor, until he was arrested in May 2016 for planning anthrax attacks. C. Felter, J. Masters, M. A. Sergie, Al-Shabab, Council on Foreign Relations, January 9, 2018: [https://www.cfr.org/backgrounder/al-shabab].